Inside you’ll find technical and safety info. The stove burns “Nut and Coal size Anthracite coal”. Just curious any idea of the cost of one of these coal stoves? Tom not sure exactly for these, but got an estimate in the $1500-2000 range. I’m told the ones from DS Machine in PA go for $1400-1800. In the Chicago home I grew up in (built circa 1885), the original heating source was coal, but both apartments had pot bellied stoves for heat (no central heat, ever). I remember my Mom telling me how she cried when she married Dad and moved into that house (he and his sibs bought it for their mother, and all lived there until they married—except Dad & our family, who stayed through the 1970’s). She said that the 1st floor bedroom (which was eventually my sisters’ & my room—VERY tiny) was used as a “coal room”, where the coal was unloaded for use in the stoves. It was filthy. She had her work cut out for her. Whenever someone mentions coal, THAT’S what comes to my mind. Eventually we heated with natural gas-powered space heaters. Can anything else be used as fuel in these stoves, like “pellets”, wood, ??? Oh my! We were blessed to have a basement; the coal was delivered through a coal shoot to the “coal bin” (a big event for us kids to watch!). We did have a coal bucket beside the coat stove in the kitchen, therefore the only time there wasn’t soot over much of it was summer time. But – I’m going to consider us very blessed because we had a basement in which to put the coal. I love hearing from others who lived with these things “back in the day”. We were definitely blessed to have parents who coped with things I’m not sure most Americans today could handle. The kind of stove and placement of it and the coal that Roberta K. described sound like the coal-burning stove and placement of the coal that my mom has described that she had in the first house she lived in, growing up. While it’s physically possible to burn other fuel types in a coal stove it’s not advisable. In fact with all the EPA regulations I’m not even sure it would be legal due to emissions. 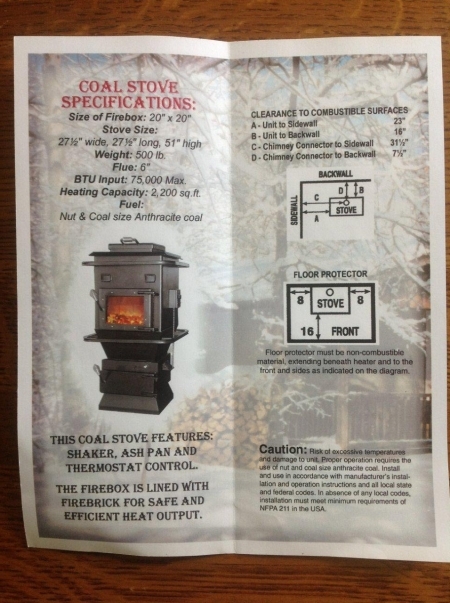 A coal stove is UL listed to burn coal. There are some exceptions. DS Machine for example, makes a dual fuel wood/coal furnace. Wood stoves by nature feed combustion air across the top of the fire, while coal stoves burn by providing combustion air under the coal bed which is then drawn up through the coal and out the flue. So it’s an entirely different burn pattern. And it’s not only burn patterns that are different. Wood stoves need to have high exhaust temperatures to reduce the buildup of creosote. Coal on the other hand burns clean and produces no creosote. Exhaust temperatures are much lower in a Coal stove. So a stove made to be efficient when exhaust gas temperatures are high, may not be as efficient when using a fuel like coal that produces a lower exhaust temperature. We still have the old coal burning stove in the basement here but never use it for coal as I do not know of a good supply source in this area. You can burn wood in a coal stove Alice Mary, but the wood will have to be cut smaller than normal as it is a smaller fire box, so therefore not very efficient for banking the fire over night. I too would be curious of the price and also if anyone has any ideas of where to get this particular type of coal, especially in Illinois. Roberta, I am curious as to where you see it needs 8′ of clearance as I do not see that. I see the 8′ in the non-combustable floor covering, but not in the clearance. Thanks for the link Alice Mary, I will definitely check it out! I think I stand corrected. I was looking at the 2nd diagram below the stove ad and I thought the “8” to the left and right was in feet, but as I look at it that is for the floor covering, rather than distance from the wall, and perhaps it is inches. I don’t see marks that make that clear but I think I jumped too quickly to a conclusion. You can get coal in Arthur, Illinois. In northern Indiana it will cost around $220 – 240 a ton in Bulk. You will not find bulk coal in Arthur, only coal in bags. Bags are fine, but you will pay $20 to $30 more a ton. If you are heating your house during the winter you can expect to burn 2-4 tons depending on how large a house you are heating. I’d lean more towards 2 ton in Illinois. If you’re interested in buring coal the website nepacrossroads.com is a wonderful forum where you can find all the help you need! Make sure you get a good CO detector before you start burning coal, but otherwise it’s a great heat source. I’m on my third winter using coal in Amish country and I won’t go back to a forced air furnace. Thank you so much ShipshewanaIndiana!! Thank you so very much ShipshewanaIndiana!! I will check out the link for sure and also check into buying coal in Arthur, IL. Arthur is about an hour and a half from here so that will be quite a haul but I do think will be worth it in the long run compared to what we pay for gas heat now. The house I have is one story plus the basement. Right around 1000sq feet each level. The coal burner would go in the basement and I would have floor grates to let the heat rise. I also have ceiling fans to help pull the heat up and circulate it throughout the main living area. I had also thought about wood but that could get quite costly as well. Thanks again for the information!! Alice Mary, thanks so much!! I will look into the site for sure. Probably not, I assured myself, but I wonder how common the name is in different Amish circles? No immediate connection between the Ohio group involved in the beard cutting and the Indiana Mullets who make the stove. There are quite a few Mullet families out here in the north eastern Indiana community. There are two variations of the name present in our community in Indiana, mullet and Mullett. Thanks for the info, ShipshewanaIndiana! I think it’s interesting to hear how people say their names and then learn how they spell the name. Yes Roberta, the floor protection is in inches. 16 to the front is standard ember protection, not for heat. This is also not a stove to fill through the front door and “bank” for the night. That would be a “stoked” type stove. This is a top loading gravity fed hopper filled from the top. It can’t burn in the hopper due to no oxygen, so it only burns around the bottom of the coal “pile” coming out the bottom of hopper on the grate. Brochure should read “Nut” (Chestnut size) or “Stove Coal” size. There is no “coal” size coal. Stove size is the largest chunk size, and burns faster = hotter with more oxygen space between the pieces. (smaller pieces burn slower, with les oxygen between them, but you get the same BTU per pound from the coal- so you use smaller pieces or “the fines” from the bottom of bin on warmer days to slow it down) The front door is only used when kindling the fire in the fall and cleaning the glass. Keeping the hopper filled once a day (one bucket normal per day, 2 buckets during very cold weather) and shaking at least twice a day is the only fire tending required. You must also wipe the glass daily. Ash from shaking settles on the glass, and water vapor from combustion becomes acidic and etches glass. Wiping with a damp cloth is all that is needed to keep clean. Some coal (Blaschak) has a higher sulfer and ash content and must be wiped daily. It is not an inferior glass, all brands etch and exhibit “checking” on the surface if not cleaned. (Robax is used by Hitzer,and probably here as well and was used on the space shuttle windows) The slider air adjustment above ash pan door is for “low burn” when thermostat door is closed. This is the most efficient burn. The automatic thermostat is a bimetallic spring and the same part used by Hitzer in Bern Ind. as well. Many Amish are using this same part on their kitchen cookstoves as well as myself. Adding this thermostat to a stove modifies it from the way it was tested, and loses it’s UL Listing. Coal dust from delivery and shoveling can be a problem if not stored outdoors. (should be covered from sunlight and wind to avoid BTU loss) What gives coal and wood use the name of being dirty is usually incorrect operation or emptying of ash. If shaken lightly in the morning to get good air flow through the firebed BEFORE opening the ash pan door, the strong rising draft in the chimney allows the flyash to be pulled into the stove instead of settling in the home. Coal use does not have to be dirty. There is no soot in the chimney and no cleaning is required like wood. It is corrosive however to metal chimney parts. Even stainless steel components. As Shipshewna mentioned, use of any fuel other than what an appliance is tested with loses it’s UL Certification. However…..
NFPA 211 is a standard, not code. Local codes adopt these standards as written by NFPA. Bulk anthricite cost now in NE PA is just over $200 a ton, and I’ve never used more than 2 tons a year to heat 2000 sf. with a Hitzer or Kitchen Queen. Both Amish built stoves. They are my only heat/cook source. We are fortunate to be in the best hard coal belt in the US. Old Company Lehigh is the best, and I get involved with firebox design and EPA particulate emission. 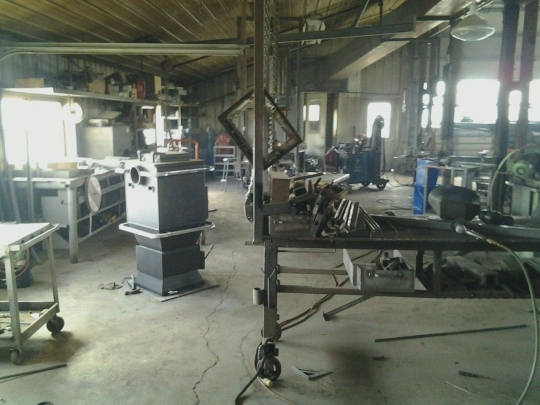 One Amish builder in Canada is currently working on a coal grate system for a very popular cookstove model. It is a wood only model now that will be listed for coal use. Cost can be approx. $20,000 to obtain a UL listing for a particular model. So they need to be sure it’s going to sell to the non-Amish that require it. It’s a misconception that “heat rises”. Hot air rises. Keep that in mind. The air that moves up must be able to drop back down when it’s cooler for circulation, or no more will rise. Heat moves in all directions including out through your basement walls. That level will be your greatest heat loss through the block and out through the walls if not insulated. First choice in selecting heater should be the availability and cheapest fuel source ! Coal is the cheapest heat pound for pound and much easier than wood. (And electricity is not needed as in pellet) Price is driven by the diesel fuel it takes to mine and haul it. Easier to store, no bugs. Wood is great if you have the land to grow it and need to get rid of the dead wood anyway. Depending on chimney, not all coal stoves will continue to burn over 50*f outdoor temperature within 24 hour period. nepacrossroads is a very good coal burning site. 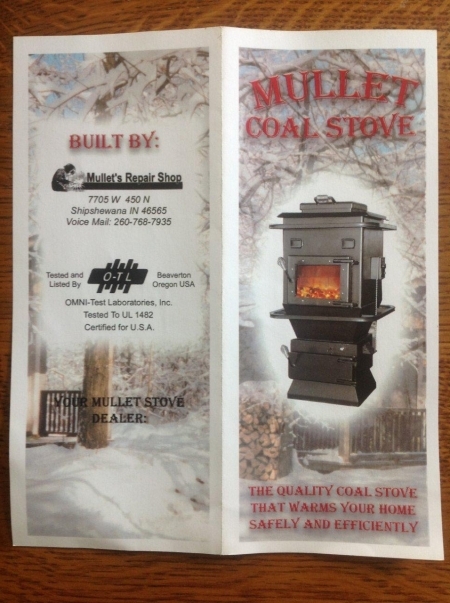 The Mullet Stove was already mentioned there. I’m “Coaly” there as well as at Hearth.com forums where we strive to keep the best information on wood, gas, pellet stoves and outdoor furnace and boilers. That’s where I post stove company history, and details of collecting and refurbishing stoves. In an emergency I have used the old burner in the basement to help heat the house, but only a dire emergency as it really is not a safe and reliable burner any more. But I do know that even without floor grates we were able to keep the house some-what comfortable during a major ice storm and power outage so I do feel it is worth researching about getting a new one. Eventually, I would like to be able to go off grid with both my heat and electricity. That will take some time and planning. I am also researching solar and wind power. Anyhow, I do appreciate your information and will be checking out the web sites and forums you mentioned. Since we’re on the subject of Amish stoves, here’s some of my favorite information on the subject. Here’s the history of the largest manufacturer; Suppertime.